She just loves to cuddle. She always comes up to your neck and puts her nose right behind your hairline. Alternatively she loves to sleep on my boyfriend's chest. She has her moments of being naughty and pulling flowers out of the garden and brining them around but the joy she has brought to our lives is incredible. We have never felt anything like this for a little dog before. And the man in my life that just couldn't understand why I wanted a dog so bad .... is completely head over heals in love with her and now states: that he can't imagine not having Lola! We love our little JRT and I hope that everyone else out there feels the same love! They truly are special. We love our JRTs. Can't imagine life without them. What joy, laughter (and sometimes frustration!) they bring. My husband was NOT a dog (or pet) person, but he is smitten with Miss Brie who arrived in March 2011 to our home. She'd been abandoned in a rental house and we cannot figure out why! She's such a love. 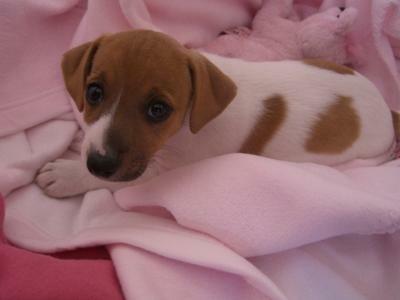 JRTs are the BEST! Glad to hear the website prepared you! Sounds like your Lola has really enriched your life polka dot bed and all. It's amazing to imagine life before my Jack's too.